HURLBURT FIELD, Florida -- Even as the Pentagon leverages new high-end technologies for potential battles against near-peer rivals, officials say special operations forces flying manned intelligence-gathering planes still have a role to play. The U-28A aircraft, for example, has intrinsic value in today's ongoing counterterrorism operations, officials said. The intelligence, surveillance and reconnaissance mission is "not platform-centric, for one. � It is exquisite for both ends of the spectrum," said Air Force Secretary Heather Wilson, referring to both high and low-end capability. "You can see there are places in the world where we enable our allies and partners to be able to train and use those kind of capabilities," she said. "At the same time, in this same command, in crisis or war � using this exquisite capability to create strategic effects is really clear," she said. Officials have questioned whether some aircraft can survive in a contested environment, with Wilson making the case to divest aircraft such as the E-8C Joint Surveillance Target Attack Radar System because it remains vulnerable. 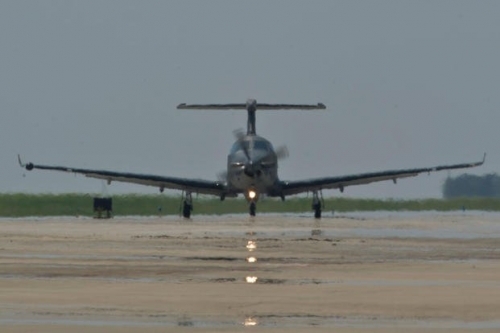 AFSOC's U-28A -- a small, repurposed Pilatus PC-12 aircraft used for ISR -- falls under nonstandard aviation, often landing in tiny, semi-prepared airfields and flying in remote areas of the world. But crew members have made the case it should stick around. "It's been around 10-12 years now, and when it first came out, that wasn't the goal in mind," Capt. Bryan, a combat systems officer with the 319th Special Operations Squadron, said on the flightline here. "It's proven to last this long, it's extremely reliable." Pilots and crew, including a combat systems officer and a tactical systems operator running "secret squirrel," or top secret, systems, said the U-28 has the ability to coordinate battle plans with other aircraft in the area, sending signals to them or operators on the ground, similar to a JSTARS. "From our perspective, it's giving that guy on the ground as complete a picture as possible," added Lt. Col. Pete Hughes, AFSOC spokesman. The taskings come from the aircraft's crew in real time, which is advantageous to an MQ-9 Reaper, for example, because a remote pilot may become too task saturated for what's going on in the airspace. Unlike its MC-12 ISR cousin, the U-28 has two high-fidelity electro-optical and forward-looking infrared sensors that can push data to "whoever wants to see it" on secure networks, Bryan said. "All of the MC-12 comms have to go through satellites," said Capt. David, also with the 319th. "We can be right overhead; we don't even need the satellite. We can talk directly to the guys on the ground and provide that good coverage for them." In recent years, the plane has been upgraded with additional sensor screens, radios and tools for sending video over networks. It can trade information securely with other platforms and has a common datalink, the legacy Link 16. Unmanned MQ-9s can fly up to 50,000 feet. But the U-28 crews -- which fly at roughly 30,000 feet -- said they're often flying higher than the Reaper on missions. "They can fly longer, but we are usually faster and a little bit closer to the fight," Bryan said. Without revealing the location, he said U.S. and partner forces wouldn't leave their base on a recent deployment unless there was a U-28 overhead. But David said the U-28 wouldn't be the first ISR aircraft to come to mind when fighting a near-peer adversary. However, it is a cost-effective tool to hunt targets or provide the ISR needed for friendlies below, which is still a big part of the Air Force's mission. To date, the platform has flown 500,000 hours, or roughly 100 hours a day, Bryan said. There are 28 in the Air Force's inventory. "We can provide four hours' station time, plus an hour there and back, and land using less fuel than it takes a C-130 just to start and taxi to the runway," David said. He reiterated its not a one-size-fits-all mission. "It has to fit," he said. Wilson added, "It's not every platform that will fit at both ends" of the tasking spectrum. And that's OK."